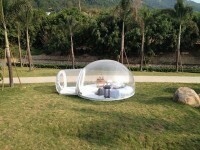 Bubble tent refers to an inflatable with abundant space for accommodation. The space is usually sealed from the top and around the sides thereby enclosing the user(s) fully. This means that the users are protected from external environmental conditions such as direct sunshine, rain, and coldness. The bubble tent is made of strong and reliable materials such as Polyvinyl Chloride (PVC) tarpaulin and UV – reflecting recyclable materials. These materials come in translucent, half-transparent and non-transparent bubbles, which gives the users a bunch to choose from. The transparent ones allow light into the tent while the non-transparent restricts light from entering; thus the user can’t also see outside directly. Bubble tents are normally designed along with sofas, roll-out beds, wardrobes, and electricity lights inside. This makes them look similar to a home or hotel room, thus easier and comfortable to use. This implies that the user can sleep, sit and have space for storage of clothes and other user commodities. Nevertheless, the lights are optional as the user(s) can opt for other means of lighting systems. This also depends on where the tent is being used. These tents are available on the market in different sizes and colors, but can readily be got online by contacting us on this very website. Bubble tents are mainly designed for outdoor use as they are simple to install and uninstall in areas like parks, amusement centers, backyards, gardens, and social events like parties. This is because the installation process requires no special skill or knowledge. This further makes the tents portable and easy to operate. They are also meant for two adults to have a private time together. However, they can be used by more than two people. That is to say; families, friends, and peers including children. These tents are oftentimes used for camping, advertising, trade shows, exhibitions, holiday activities, promotion, and outdoor shelter for people and objects. 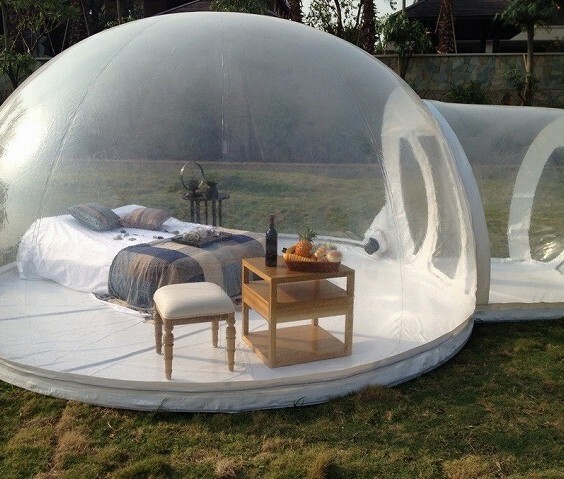 A bubble tent is an inflatable tent that you can share with your loved ones when you go camping. It is constructed in different sizes, but with big space similar to that of a hotel room. It consists of a portable wardrobe, furniture such as a sofa-set, a bed, a carpet, and lighting equipment. The tent contains almost everything that you would need including a kitchen, in some. 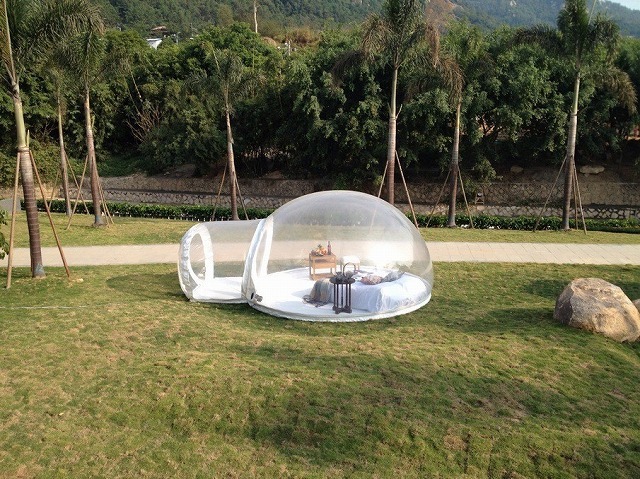 This type of tent is commonly made of transparent materials which allow immense daylight inside and also provide a clear outside view. These materials include Thermoplastic Polyurethane (TPU) and Polyvinyl Chloride (PVC) tarpaulin. 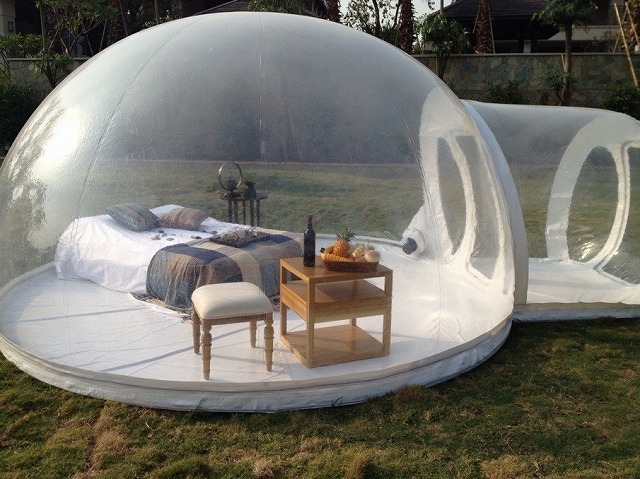 The transparent nature of most of these tents is truly one of the reasons why they are profoundly recommended for places besides the beach, gardens, countrysides, parks, amusement centers, deserts, and picnic centers, among others. They are initially designed for adults, to be exact two people, though it can also be improvised with another bedroom for children. This means that you can go out camping with the entire family, a group of friends, colleagues, or any other loved ones and make use of such tents. Nonetheless, you should first consult for the number of individuals the inflatable tent is supposed to host. 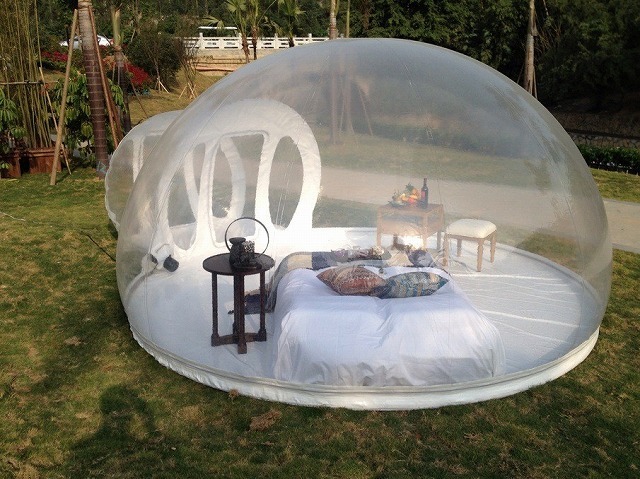 Bubble tents are exceedingly enticing, relaxing, safe and reliable to use. This is because they are designed to keep out bugs and bad weather like rains, hot sunshine, and cold without obstructing a direct view outside. This allows you to watch the sunrise and sunset while inside. Also, it gives you the opportunity to stare at the sky at night, and view the beautiful twinkling stars. Meanwhile; these tents can also be utilized for other activities such as displaying products in malls, promotions, advertising, and exhibitions. They are generally easy to use and acquire by contacting us with your order via this website.